The Iguanas pack managed to slow the Pigs favoured “Pick and Go” style of play and with a few turn overs at the break down the Pigs will surely look to bolster this usually unbreakable aspect of their game before taking on the DHL Cayman Storm on Saturday. The Pigs Trotters, clearly frustrated with the long string on losses made life even easier for the Iguanas when Graeme Thompson saw yellow and his team were left with 14 men on the pitch for 10 minutes allowing the Iguanas an easy time in defence as the Pigs Trotters looked for one more score, a score which eventually came in the form of a 10 meter Paul Parker run to the line. In the 4pm fixture the DHL Storm managed a 2nd straight Alex Alexander Memorial Trophy win to send their team to the top of the leader board against the Krys Global Buccaneers. The game looked set to be a real battle of attrition between the two teams with the Buccaneer pack dominating the Storm forwards whilst the Storm backline made their usual inroads in attack. The Storm back line, which had little joy against the Iguanas only the week before managed 29 points against the Buccaneers with Simon Crompton and Vanassio Tokotokovanua both getting 2 tries followed by Michael Sumares notching up 9 points with his own try and 2 conversions. 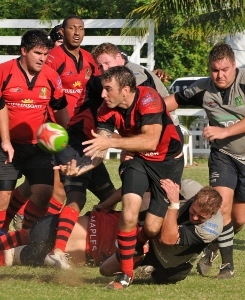 The Buccaneers could only manage 8 points thanks to a Ben Blair score and a Mariano Marco drop goal. The Storm move into round three looking for a win over the Pigs Trotters whom they beat in a fiery Heineken Wooden Spoon fixture early on the season. If the Pigs Trotters have done their homework and learnt from the mistakes made by the Iguanas and the Buccaneers this season then the Pigs could earn their first XV’s win in over a year over the current league leaders. 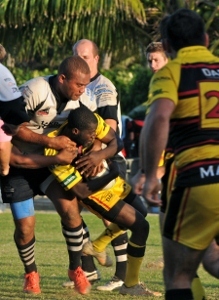 All games are streamed live worldwide on www.caymanrugbytv.com and follow us on Facebook!